I have been baking for 3 years now and I do have my share of baking highs and lows. Behind the scenes there is a lot of messed up baking experiments, food thrown away and sometimes I even have said to myself that I’m not baking anymore, that’s it and I’ve had enough. But once in a while I stumble upon some excellent recipe, do my tweaks to make it eggless and it turns out nothing less of awesome. 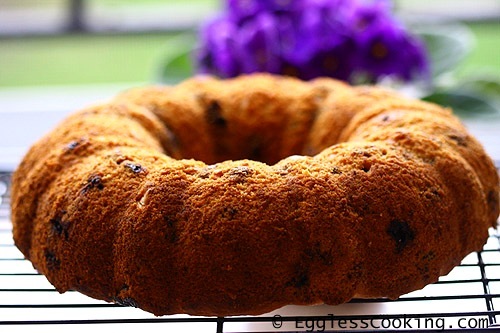 So this blueberry pound cake is one such recipe. I’m really very proud of this one. It was an ego booster for me after a couple of goof ups in a row. This recipe is once again from my favorite and trusted recipe source, Taste of Home. Also my blueberry luck is still continuing; anything I bake with blueberries becomes a huge hit. This pound cake recipe is no exception to that. This recipe definitely has a place in my favorites list and I can see baking this again and again. I think I may have found something phenomenal with this recipe. The magic proportion of egg substitute in cake recipes! 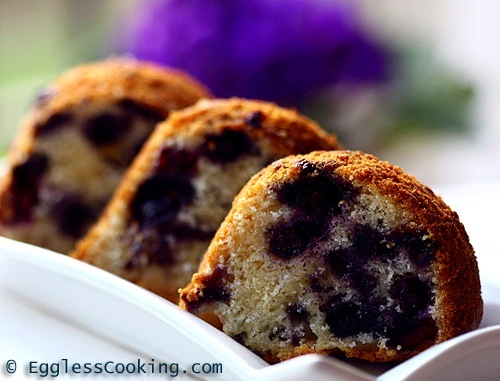 If you’re a fan of blueberries, check out the blueberry coffee cake too. I’m very confident that this rich, fluffy and yummy blueberry pound cake recipe will become your go-to recipe when you have company, or have to impress somebody or just to lift your spirits. Preheat oven at 350F/180C for 15 minutes. Grease and flour a bundt pan. Blend silken tofu and yogurt separately; measure 1/2 cup each. In a small bowl mix together the pureed tofu, yogurt, milk and vanilla extract. In another bowl sift together the flour, baking powder, baking soda and salt; set aside. Cream the butter and sugar in a large bowl until it’s light and fluffy. It will take about 5 minutes. To this mixture add the liquid ingredients in 3 additions, beating well after each addition. Now combine the dry ingredients and blend well. Pour the batter into the prepared pan and bake for about 60-70 minutes or until a toothpick inserted in the center of the cake comes out clean. Mine was done in 60 minutes. Remove the pan from the oven and let it cool on a wire rack. You will be able to remove the cake from the pan in about 20-25 minutes. Keep the cake on the wire rack and let it cool completely. I can’t say enough about the taste of this blueberry pound cake because it was so DECADENT, DELCIOUS and DAMN GOOD! Even that’s an understatement. The texture was very good too; light, fluffy and airy just like cakes with eggs. The cake flour did the trick I guess. I think I have found out the magic proportion of egg substitute for cake recipes! It’s half tofu and half yogurt. The cake also had the wonderful aroma of butter. 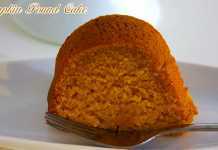 So this pound cake had 3 dimensions favoring it; the taste, texture and aroma. If using frozen blueberries, don’t thaw it or else the color would bleed. I also tried a combination of strawberries and pineapple in the same recipe and it came out very good as well. I’m not sure if you would get the same amazing result with plain all purpose flour. 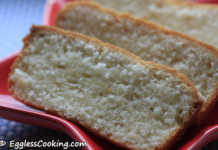 So take my word and do try this pound cake recipe with cake flour. If you don’t have a bundt pan, use a 13×9 inch pan instead and bake for about 35-45 minutes. Previous RecipeHow To Line A Pan With Parchment Paper? Hi, can i bake this recipe in a regular pan, rather than bundt pan? will the baking time increase? You would need a large size pan if you want to use a regular pan. I think a 9×13 inch pan would suffice. Yes, the baking time will vary, probably decrease actually. 35-40 minutes maximum. Whats the difference between cake flour and all purpose flour, and if i use all purpose flour will the taste and texture of this cake change? Can I make cupcakes of this? N Thank u for theses wonderful recipes. I think it should work Preet. Can I use dried blueberries instead of fresh. Yes it should work Rinku. I appreciate your efforts and love for baking. Next time try to make a video it will be convenient and easy for understanding. Any tips for baking in presure cooker. Thanks Latha. Yes we have a couple of video recipes. Will try to make it more frequently. I haven’t baked in pressure cooker. Sorry. 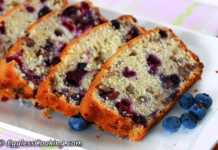 I would like to try this Blueberry Pound Cake but I’m allergic to egg yolks and soy. What do you suggest I replace the silken tofu with? Hmm..you can try it with unsweetened applesauce instead of tofu. But let me warn ahead the texture might not be the same as one with tofu. I would like to try this with whole wheat flour. What do you suggest to take care or worry about if I have to use whole wheat flour? I observe most of my cakes come out dense with whole wheat. Yes it will be dense. Try with whole wheat pastry flour instead or half all-purpose flour and half whole wheat flour. Hi, may I know how to transfer recipe to weight in gram fomula? Please check the baking measurements page Sim. Made this cake wasn’t sure how it will come out but amazingly it was a perfect thumbs up cake without eggs. Just one thing was I needed to add extra 1/2 cup milk as mixture was dry.wish could add picture of my cake . You will get the best possible texture with the combination of tofu and yogurt. But you may try it just with yogurt too. Yes dried is also ok. I really don’t what tofu is? how to make cake flour at home .? For each cup of cake flour, measure out 1 cup of all-purpose flour, remove 2 tablespoons and add 2 tablespoons of cornstarch and sift it well. Hi, I know u said the silken tofu-yogurt combination lend the softness.. But is there anyway I can replace tofu with whole yogurt or can you suggest someother eggless substitutes?? You may try it with all yogurt and see if it works. I haven’t tried it though. In the original recipe how many eggs did it use? Or the half-half tofu/yogurt how many eggs is it replacing? Hi, how long does this cake keep, refrigerated/not refrigerated? I’m not sure. It was gone within 3 days at our place. I’m thinking it’s the same Paola. It’s called cake or pastry flour. Kindly advise where do you buy from ? It’s silken tofu. Where do you live? In US it’s available in almost all grocery stores. Good recipe, turned out very nice and moist. I baked it in 13 X 9 pan. Felt I could have reduced the sugar & blueberries a little, by 1/4 cups each. felt a little too sweet. But still tested great and everyone liked it. Do I need to refrigerate it to keep it for couple of days? Thanks Ravi. Yes you would need to store it in the fridge but put it out at room temperature for at least 10-15 minutes before serving. Can i use blueberry crush instead of fresh.blueberry??? What is blueberry crush? Is it jam/jelly sort of thing? 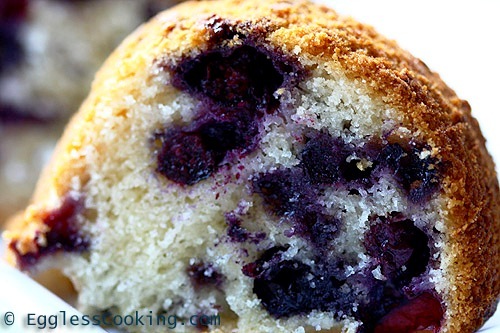 I would have made this cake with and without blueberries several times and it was always awesome. Thanks for the great recipe. Silken tofu idea makes eggless baking enjoyable. I want to make muffins by substituting cake flour with whole wheat pastry flour. Also can I substitute butter with anything else? Please advise. Thank you very much Shanthi. Yes I use whole wheat pastry flour a lot especially while baking muffins and it does turn out good. Depending upon the recipe you can use oil and adjust the quantity of other liquid ingredients in the recipe. Can you use 1 cup yogurt instead of Pureed Silken Tofu? You could but I don’t think it will be as good as the original recipe.